Tour de France winner Alberto Contador admits he is "pleased" the probe into his doping case is being carried out by Spain's cycling federation (RFEC). During this year's Tour Contador tested positive for banned drug clenbuterol, which the Spanish three-time champion insists came from contaminated meat. Contador was provisionally suspended by cycling's world body UCI, but on Monday it asked the RFEC to handle the case. And the 27-year-old welcomed the move "because it means we can move forward". 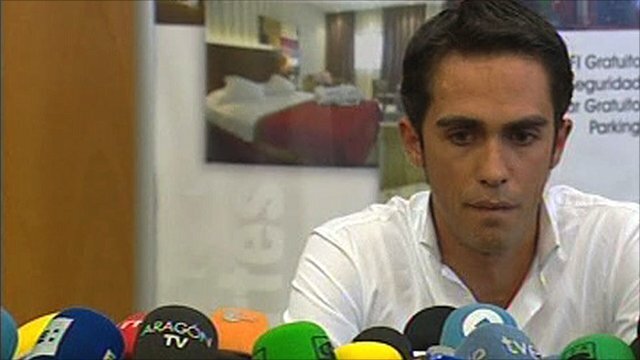 A statement released by his spokesman, Jacinto Vidarte, added: "The legal team of Alberto Contador, after receiving and carefully studying the report submitted by the International Cycling Union to the Spanish cycling federation, maintains their optimism and confidence in bringing a resolution to the case. "The dossier prepared by the UCI and World Anti-Doping Agency [Wada] focuses on the hypothesis of food contamination. "Thus, according to documents submitted by the UCI and Wada, food contamination remains the only reasonable explanation from a scientific point of view to justify the presence of the tiny amount of clenbuterol in the body of the rider during the Tour de France." It continued: "[Contador's legal team] are working with the hope of a verdict in the shortest possible time, with the objective that Alberto Contador can begin the next cycling season without any obstacle." Vidarte also revealed that Contador's defence will be led by Swiss lawyer Rocco Taminelli, who defended Italian rider Franco Pellizotti when he was acquitted of doping charges in Italy in October. The UCI tests riders at the Tour but the national authorities are responsible for carrying out investigations and prosecutions. Under UCI rules, the RFEC's procedure must be completed within a month, while the Spanish body's chief, Juan Carlos Castano, was quoted in Spanish sports newspaper AS as saying his organisation would take "at least two months" to decide whether to sanction Contador or not. If the test failure is upheld then Contador, a yellow jersey winner in Paris first in 2007 and then in 2009, could be stripped of his 2010 Tour title and also given a two-year ban. The only previous Tour winner to be stripped of their title was Floyd Landis in 2006. If the Spanish federation decides not to punish Contador, the UCI and Wada can appeal to the Court of Arbitration for Sport (Cas). Clenbuterol is a muscle-building and fat-burning drug. A Wada-accredited lab in Cologne, Germany, found a "very small concentration" of the substance in Contador's urine sample on 21 July. However, the amount was 400 times less than the 50 picogram benchmark measurement that anti-doping laboratories accredited by Wada must be able to detect.